HUMBOLDT PARK — Mayor Rahm Emanuel on Tuesday praised the potential unifying impact of The 606 project and its elevated Bloomingdale Trail, which cuts through four city neighborhoods and is set to open on Saturday. The mayor toured a quarter-mile stretch of the Bloomingdale Trail’s western end near the Kimball Arts Center 1757 N. Kimball Ave. in Humboldt Park on Tuesday. “What used to divide neighborhoods will bring different parts of the city together. It’s a landmark public space. All of the years of advocacy, bake sales and community meetings will finally pay off for residents,” Emanuel said. Part of a larger Chicago Park District system dubbed The 606, named for the first three numerals of the zip code all Chicago residents share, the ADA accessible trail has 12 spots where you can hop on or off. Running from Bucktown and Wicker Park on the east to Logan Square and Humboldt Park on the west, the trail is the city’s first park that also functions as a commuter route. The majority of the $95 million cost to build The 606 came from a $50 million Federal Congestion Air Mitigation Quality or CMAQ grant. Another $20 million was raised through private fundraising and $5 million was committed from local government, said Beth White, Director of the Trust for Public Land’s Chicago Region Office. White told a small army of reporters that there is still an additional $20 million to raise from private funding for the completion of some of the ground-level access parks, though the entire trail itself will be ready for the public to enjoy on Saturday. “We made the bold decision to open the path all at one time,” White said. 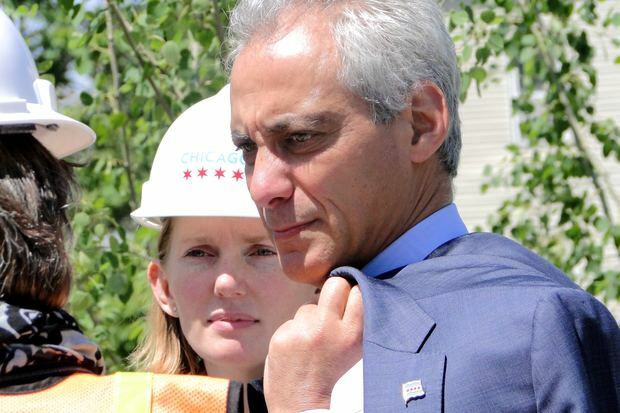 As she did in August 2013 at the trail’s groundbreaking ceremony in Bucktown, White again called Emanuel the trail’s number one fan, extolling the benefits of the park, which will improve the lives of 80,000 people living within 10 minutes of the trail. In addition to the trail, which has 2-foot shoulders on each side for joggers (and will be painted with center marking lines on Wednesday), there are many new plantings and trees, as well as maps to guide the way. Affixed to fences along the trail, the welcome signs show folks where they can get on the trail through an access point, or through a park. Markers are also included for nearby on-street bikeways, CTA buses and Blue Line “L” stations. “You’re on the Bloomingdale Trail, the centerpiece of The 606. It’s a place where neighbors meet, folks walk, friends ride bikes and runners take off. Come explore,” the welcome sign reads. When the trail opens Saturday, four of the access points will be through ground-level parks: Walsh Park, 1722 N. Ashland Ave.; Churchill Park, 1825 N. Damen Ave.; Julia de Burgos Park, 1805 N. Albany Ave.; and Park 567, 1805 N. Milwaukee Ave.